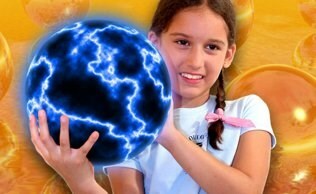 Expore a UNIVERSE OF STORIES with Mad Science this summer! Atmosphere and Beyond has students discovering the properties of the air around us and explore the atmosphere of the Earth and those of planets beyond. Students will be challenged to keep Arny the Aquanaut dry during an underwater walk, and to create their very own sunset. In Space Phenomena, students will explore the phenomenal events that take place in the night sky. 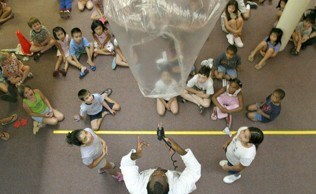 Children will create their own impact craters, and observe model meteors fall through a model atmosphere. Sun and Stars has students investigating the Sun, distant stars, and the galaxies they form. Children will explore stellar life cycles, create new solar systems, and make their own constellations. In Living in Space students will set out on a mission to investigate life in space. Children will see the special adaptations needed to live in space, learn about mission training techniques, and participate in the construction of a model space station.Explore space as we travel to the outer reaches of our solar system! Explore space as we travel to the outer reaches of our solar system! First we will look closely at the Earth's atmosphere and see just how vital it is to humans. Then we will begin our journey, dodging comets and meteors, and make our first stop on the Moon! Take a picture and put your boot into the Moon's surface! And, if that is not enough, prepare for liftoff with a miniature rocket launch! Leave your learners astronomically awe-struck with 3, 2, 1...Blast Off! This event is suitable for all ages, and a great choice for your summer reading kick-off event or wrap-up celebration! You can also sumit a web inquiry and we will get right back to you!